Looking for something red hot and sticky to liven up this Friday? 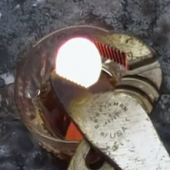 No worries you’ll get busted for watching this video at work, where YouTube user carsandwater sees what happens when a hot ball of nickel is dropped into a glass of honey. Though the video’s description explains this was, in part, a safety demonstration, we’re not sure it’s ever a good idea to throw a glowing hot anything into a glass cup and put a camera near it. Needless to say, don’t try this at home.